Thank you for visiting our website. Dr. Gale Perry specializes in treating a variety of conditions including headache, migraines, neck and back pain, fibromyalgia and other conditions. Please continue looking at our website to see other conditions that have been helped. 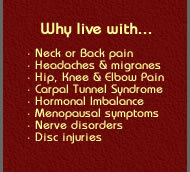 Find out today if our wellness clinic can help you! Our goal is to help people regain their health as quickly as possible. Our clinic uses gentle, pain-free spinal alignment using manual manipulation as well as very gentle instrument adjusting, acupuncture, physiotherapy, exercise and other tools to obtain maximum health for the individual. Each patient’s individual situation is assessed to determine the best care for that person. Copyright © Perry Chiropractic and Acupuncture Clinic, All Rights Reserved.